Hey there guys! Welcome back so this is kind of a random design for this time of year but maybe you are going to be something tropical for Halloween, or maybe you are like me and love anything tropical all of the time! ;) Anywhoo today's post is a swatch post + a Paint With Me video so we have a lot to get through, so lets go! A creme-y yellow with an ever slight pink shimmer. However the shimmer that is seen within the bottle doesn't really show on the nail. I really enjoyed this yellow. It applied really nicely and had full coverage in just 2 quick and easy coats. Really nice and easy to work with formula. A pink holographic top coat. 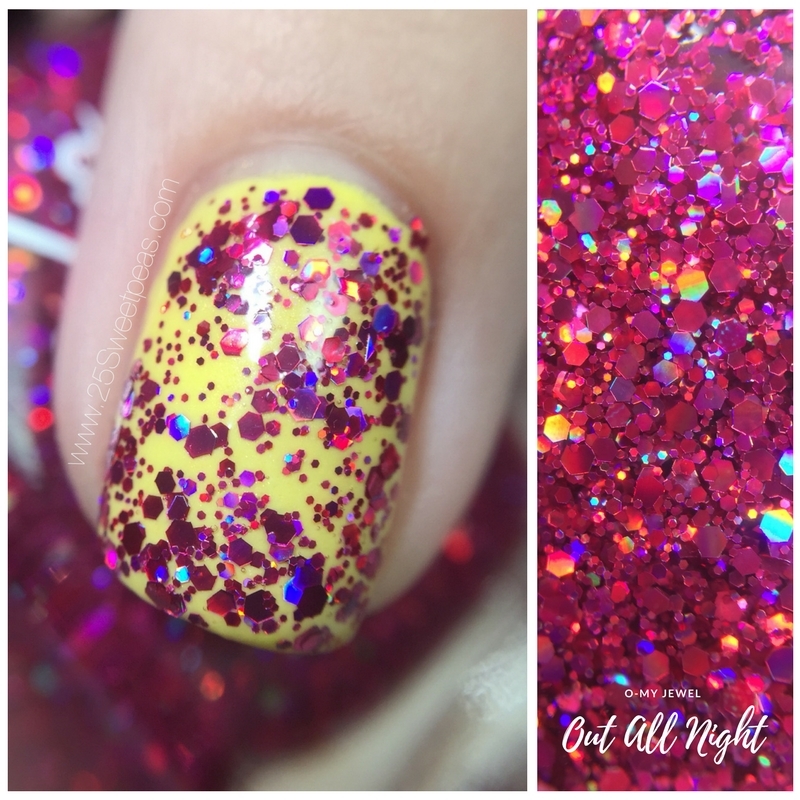 This polish is for sure one you would want to use as a topper, and it is amazing as a Topper! Seriously this is the coverage you get in just one coat, no fishing. I was so very impressed. I mean look at that coverage. You could easily sponge this on to also get great coverage. The holographic pink glitters are so great. I don't often use polishes like this but this one had totally made me rethink that. I need to use them more because this is so fun. Now lets check out this Paint with me Video! Isn't this such a fun combo! Below are the final photos of this look. You could do this in so many different color combos too. I mean you could even go as far as doing it in Christmas Colors to get a topical Christmas vibe. Ok, now that I have said that I am kind of obsessed with that idea! 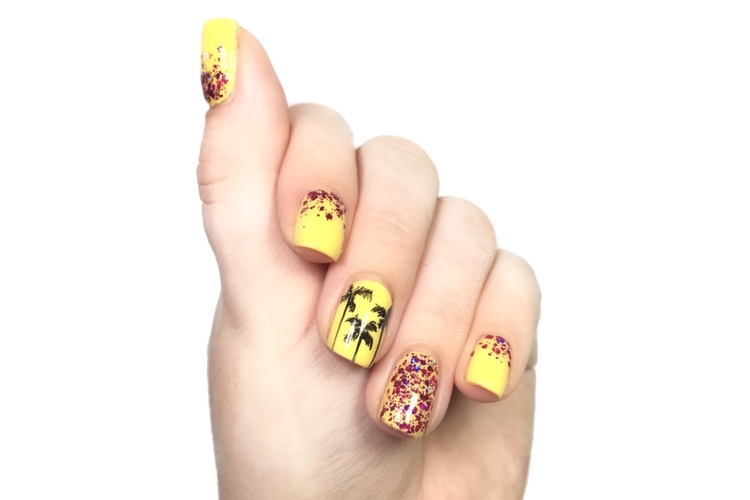 The palm trees were done with acrylic paint as you saw in the video and it was really simple and quick. After you are all done you just top everything with your favorite top coat. Also I didn't notice the glitter leaving a textured feeling so that is good to know for those of you who don't like that. Well guys that is it for today! Both of these O-My Jewel polishes are available now and you can find them all HERE. Also you can keep up with all thing O-My Jewels on all of the links below! Your palm trees are awesome! Thank you so much! They are so fun to do! Agreed and I'm not a yellow person typically! So glad you like it! I'm game for tropical nails any time of year! This is really cute, and I love the base shade you used a lot! Me too! Hehe! Thank you so much! Its a really nice yellow! Pink and yellow go so well together! The palm tree nail art is the perfect added touch. They really do! Thank you so much! I am tropical year round. Love this combo! Those palm trees are seriously awesome. I live in Hawaii so tropical is year round but if I wasn't, I would be taken there instantly with this mani. Yay! Thank you so much! Oooo, I have never been but want to some time! Love tropical places! Lucky enough to be on the South East Coast so we are pretty lucky! Love a two coat yellow! Right! Plus this shade is so wearable! Love your final mani...turned out so great. Your palm trees are perfect!